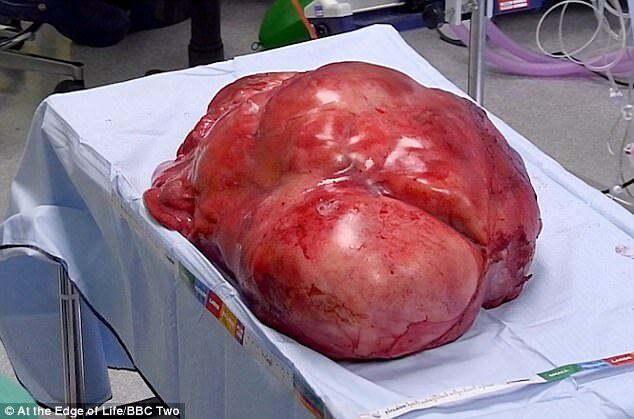 A 74-year-old woman who was given four weeks to live because a 19.5kg tumour in her stomach was squashing her vital organs has had it removed. The nail-biting moment doctors carried out the complex surgery on the patient, known only as Jasmine, will be shown on a new TV show which gives a fascinating glimpse behind-the-scenes in operating theatres. The doctors couldn’t be sure whether they would be able to save her until they opened her up and inspected what’s going on – so Jasmine’s fate hung in the balance. The BBC Two series Surgeons: At The Edge Of Life follows some of the country’s top medics at Queen Elizabeth Hospital Birmingham as they carry out life or death procedures.